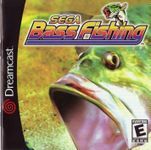 Sega Bass Fishing is a video game published for arcade, Dreamcast, Windows and Wii. The game is fully playable with the standard Dreamcast Controller, but it is also compatible with the Sega Fishing Controller for more realistic play. The game struggled with critics due to its narrow nature. However, it did showcase the amazing graphical capabilities of the Dreamcast with the fish moving fluidly to create a smooth fishing experience. It sold well and became one of the few Sega All Stars titles. A sequel, Sega Bass Fishing 2 was released in 2001 for the Dreamcast.